We here at GFR have often bemoaned the appalling lack of flying cars here in the futuristic era that is 2012. Sure, we have amazing technologies such as smart phones and GPS and submersibles that allow movie directors to dive to the bottom of the sea. What we don’t have? Friggin’ flying cars. Sure, flying cars would almost certainly be prohibitively expensive, and putting the average semi-attentive driver behind the wheel of an airborne automobile would likely be as dangerous as putting a trio of hyperactive gibbons behind the wheel of a normal car. Anyway you shake it, flying cars are probably better left in fiction. But they’re just so damned cool in Back to the Future! 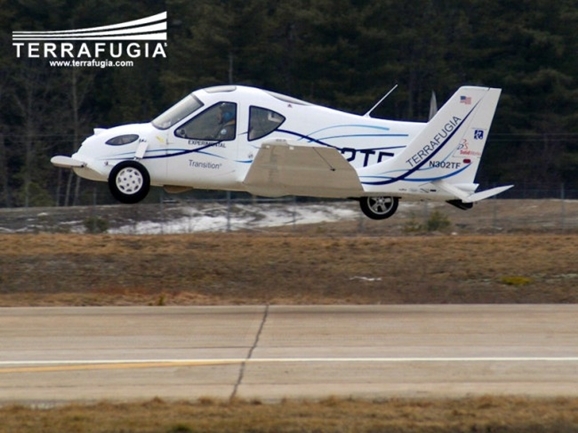 So, for those of you like us, still holding out hope for a flying car in the driveway, we present this: the Transition, an honest-to-gosh flying car, developed by the U.S. company Terrafugia. Okay, okay, it’s not nearly as cool looking as Blade Runner‘s spinners or Dallas’ cab in The Fifth Element, but the prototype vehicle does indeed combine the qualities of a car and an airplane. That means you can fly to your destination, land, fold up the wings, and continue on down the highway. As Terrafugia Vice President of Sales Cliff Allen says, “It’s the first street legal airplane in the world.” And it’s a steal at around $280,000! And by that I mean that most of us would have to steal $280,000 to be able to afford one. Allen introduced the vehicle at the New York International Auto Show, explaining that it had already completed a successful test flight this past March 23rd. Dr. Schwegart, one of Terrafugia’s engineers, said that they were initially unsure how well the vehicle would manage take-off. “Unlike a normal plane, it cannot rock back on its rear wheels at the moment of take-off because it is designed to be stable as a car on the road.” Nevertheless, a retired Air Force volunteer took the craft to 14,000 feet and cruised around for eight minutes before returning to Earth. This just isn’t practical. You need some form of VTOL. They should be focusing on a domestic helicopter solutions that encloses the rotors so they are not whirling swords. Either that or jet propulsion VTOL but that would be a very big fire hazard.